Small Little Big Foots. Great for school Play Days, Community Events, Family Reunions, Company Picnics & Church Events. Two Teams of 2 people need to "WORK TOGETHER" to walk down to the finish line. Require team work, co-operation. Set included 2 pair of small feet. 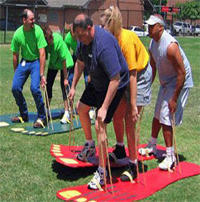 Innovative, exciting and fun team building activities for your group available. Creating a high energy team building event or corporate activity that can engage, entertain and educate employees is a great way to achieve this goal.